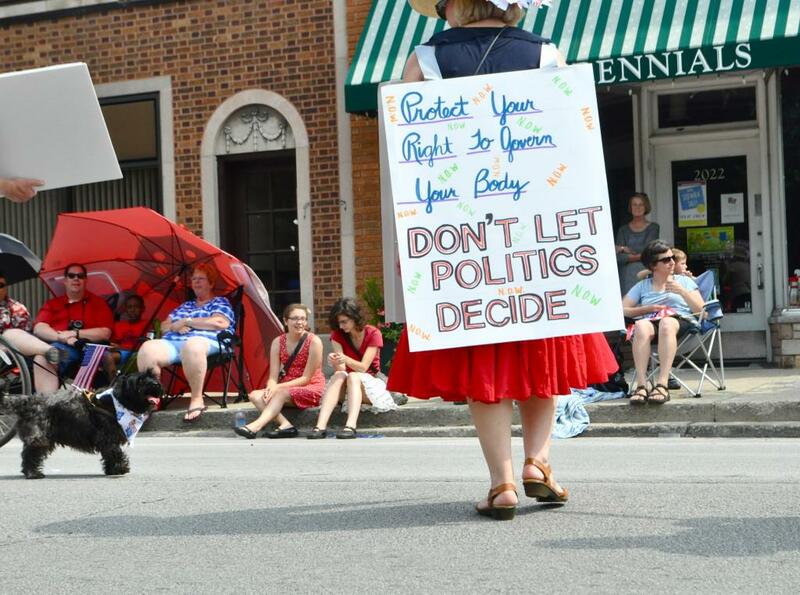 A representative from the National Organization for Women joins other groups advocating for abortion rights, including the Pro-Choice Coalition, in Evanston's July Fourth parade on Thursday. Some residents said the parade has gotten too political in recent years. As Evanston’s July Fourth parade filled Central Street on Thursday, longtime residents said the yearly tradition has turned too political. Illinois Gov. Pat Quinn, a Democrat, marched in the 92nd annual parade surrounded by supporters waving bright green signs and wearing shirts of the same color. Evanston Mayor Elizabeth Tisdahl and three former mayors were also present, as well as State Rep. Robyn Gabel (D-Evanston). Political campaigns also participated, including supporters of state Sen. Daniel Biss (D-Evanston) and U.S. Rep Jan Schakowsky (D-Ill.). Carol Joseph, 53, grew up in Evanston watching her neighbors build their floats every year. She now returns to the parade with her husband to see how much the it resembles the one of her youth. An Evanston resident since birth, Carl Ekman, 77, has celebrated July Fourth in the city for 65 years and seen the parade almost every year. As Ekman watched the parade outside his apartment building on Thursday, he flipped through its program, counting the names of trustees, lawmakers, judges and activists. He shook his head. “Now there are only three or four bands and more political things,” Ekman said. However, not everyone was bothered by the parade’s political participants. Like Ekman, Bill Casper, 65, has been attending the parade since childhood. He said does not mind the politicians. Rosie Rees, 62, said politics is a natural part of the community the parade celebrates. Maddie Colbert and Kelly Norris are rising high school seniors participating this summer in the Medill-Northwestern Journalism Institute.